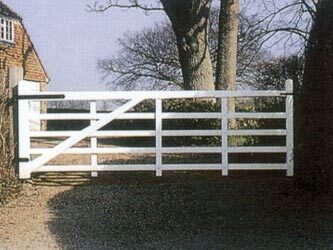 Simple but rigidly structured, the Kent gate has it's own characteristic charm and is suited to use as either an entrance gate (shown here painted white) or as a field gate. Available in treated softwood, the construction incorporates the standard design features, planed components throughout and with stop chamfers. Recommended Gate Post size is 7' high with the diameter listed below.